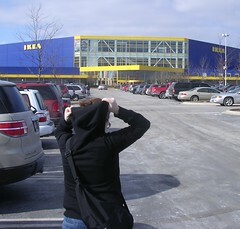 Deb's Cup of Tea: Jessie and Deb go to IKEA, again. We hadn't gone to IKEA since August, when I bought my office chair. It was 16 degrees with a breeze out so it felt like about 7. Why isn't Jessie wearing a coat? Because all of her coats make her look like Vim the Michelin Man and we weren't there to buy, we were there to measure and look. So, WHEN, not if she got overheated, we'd have to carry the coat and it wasn't worth it. Plus, the bracing air temperature is good for you in small doses which is what we got when we walked from the car to the store. All we did was wander, measure, pick up, examine, dream, wish and make notes. She wound up taking a bunch of photos with her iPhone. These will be used for future reference. Will this chest of drawers fit here? Is this credenza the right height? Is this too long? Maybe this won't look good here. In our wanderings, we entered this department. This display struck me as humorous. 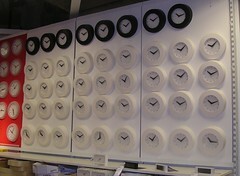 I remember reading somewhere why 10:10 is the preferred time for clocks but I can't find it now. No, I didn't buy anything. I just wandered. Jessie got a picture frame for a cross-stitch she completed and needed to frame. Grand total: $5.36. Then back into the cold and over to Panera for soup and sandwiches.